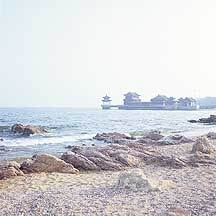 山海关Shanhaiguan Pass, called 榆关Yuguan in the past, is in 河北省Hebei province, about 15 km. from 秦皇岛Qinhuangdao's city center. 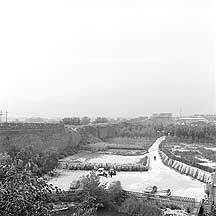 A strategic pass in the northeast since antiquity; its present fortress and Wall were built in the fourteenth year (1381) of the 洪武Hongwu reign during the 明朝Ming Dynasty (1368-1644) by the great general, 徐达Xu Da. 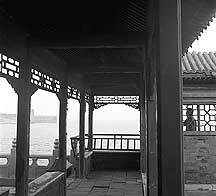 To its northwest lies the 燕山脉Yanshan mountain range, and to its east the 渤海Bohai Sea marks the end of land — thus, comes the name 山海关Shanhaiguan (Pass between Mountain and Sea). 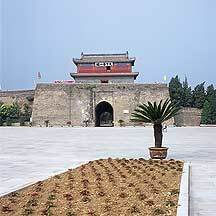 Shanhaiguan has 4 gates, of which the most well-known and the most important is the town's east gate, called 镇东门Zhendongmen. 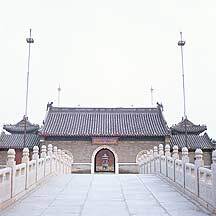 But because poetics and drama stick to the populace more, this gate has since been known as "天下第一关城楼"(The First Pass Under Heaven Gate Tower) or simply the "第一关城楼"(The First Pass Gate Tower). 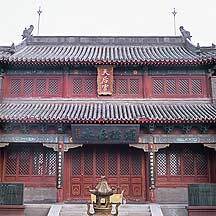 This is due to the huge board hanging on the face of the gate tower with the four large characters "天下第一关"(First Pass Under Heaven) written by the Ming calligrapher 萧显Xiao Xian. 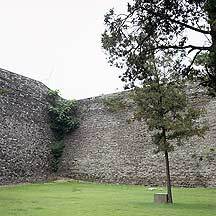 The gate walls are 14 meters high and 7 meters thick, and these surround an inner town with a perimeter of 4 kilometers. The Great Wall connects to The First Pass and runs 26 kilometers across the town and up the western hills, and links the 老龙头Laolongtou (Old Dragon Head) to the 渤海Bohai Sea in the east. The square area before the gate tower. On the face of the grand 镇东门Zhendongmen tower is the written these large black characters: 天下第一关 (The First Pass Under Heaven). The wide square before 天下第一关 (The First Pass Under Heaven) gate tower. A corner of the fortress. On the top level of the fortress. A view below the Wall. The lake and garden inside the fortress. 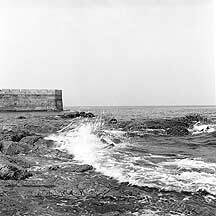 The Wall stretches quite far through the town, but most are in ruins and covered with thick vegetation. These unrestored parts are blocked with walls, so one cannot get through. On top of one stretch of the Wall extending from the gate tower. 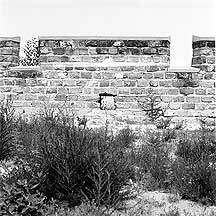 Detail of the Wall's parapet, an architectural design meant for the bow and the crossbow. 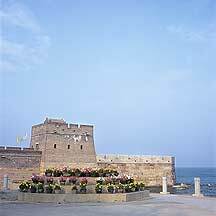 The tower overlooking the Dragon Head and the 渤海Bohai sea. A gallery of stone tablets. An important original piece is housed inside a pavillion. 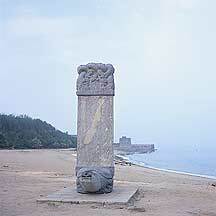 The Dragon stretches its Head into the 渤海Bohai sea. A viewing area a few steps below the Dragon Head. The Old Dragon Head had been reconstructed in eighties. 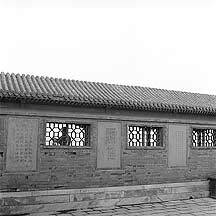 These are Ming stones of the original Dragon Head on display right on the structure. Side view of the Dragon Head. Side view of the Dragon Head as it enters the sea. A stone bridge leads to the entrance gate of the temple complex. The long corridor around the temple complex. The grand pavillion extending out from the temples toward the sea. 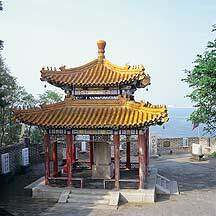 老龙头Laolongtou (Old Dragon Head) is about 4 kilometers south of Shanhaiguan. 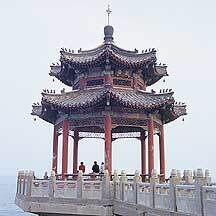 The "Dragon's Head" refers to the group of structures that converges on the 渤海Bohai Sea. 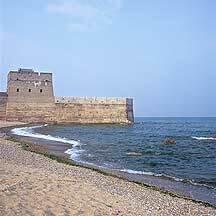 The most dramatic is the section that enters the water, called “入海石城”(The Stone Fort Entering the Sea). As I stood on the shore observing its profile, I thought: Old Dragon's Head — the ancient mythological beast's long jaw, knotty forehead and scaled neck reveals itself as it slowly submerges and retires to the sea. After tens of thousands of li — from its desert tail end in the western China crawling through mostly barren highllands and wastelands, then descending toward east, winding through its rolling green hills and craggy mountains — its solemn head finally reaches into water and urges for the depth of the sea. 戚继光Qi Jiguang, the Ming army general of the area (then called 蓟镇Jizhen) directed the construction of Laolongtou during the worthless 万历Wanli reign. 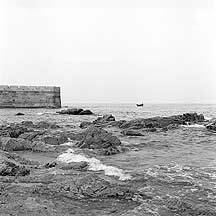 It was built with much difficulites: when the tide subsided, the entire army worked rapidly stacking the stones, but then the tides soon returned, destroying much of work; this went back and forth til the work was completed. 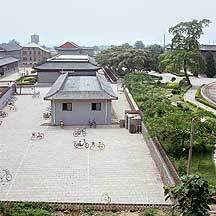 The structure was restored several times during the 清朝Qing Dynasty (1644-1911). During the 1980s, Dragon Head was entirely reconstructed according to old records. 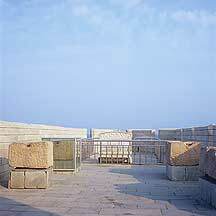 Some pieces of the original stones were incorporated back into the construction. Other pieces are on display on the top level of the Dragon Head. 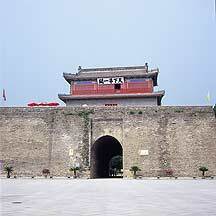 After visiting The First Pass gate tower, I went into the nearby Shanhaiguan Great Wall Museum. 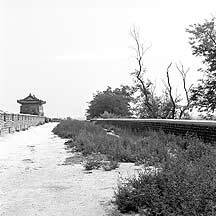 Besides the panaramic view of many sections of the Great Wall, there is an excellent collection of early gun-powered weapons used on the Wall: the first cannons made out of stones and cast iron; and the proto rifles and handguns, which would eventually evolved into the first true handguns. 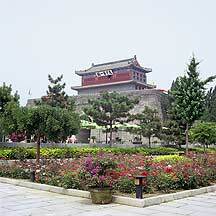 Anyone visiting Shanhaiguan should drop in this museum for a look. Getting to Shanhaiguan: At the time I headed down to 山海关Shanhaiguan from 沈阳市Shenyang city by rail. The Pass is a district of 秦皇岛Qinhuangdao, and it has its own station. 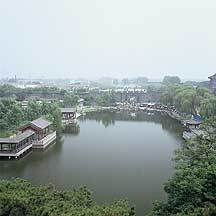 It is a short ride from Qinhuangdao city and about 3 hours ride from 北京Beijing. 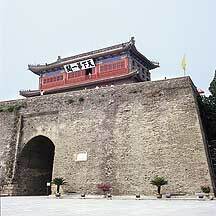 Shanhaiguan's gate towers are visible from the train station. Buses from Qinhuangdao city will also get here. 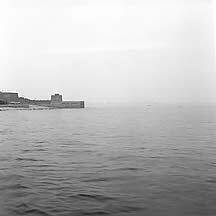 Once in the town, the walled towers are usually within sight. If not, local buses will stop near it. It's bus stop has its alto ego stamped on it: 第一关站First Pass Stop. Get off and walk to the entrance. If this is the stop on the highway (if I remember correctly, it cuts through the town. 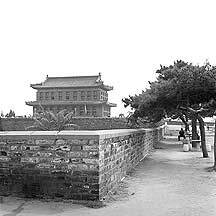 This is the same road that leads to the Old Dragon's Head site in the east by the Bohai sea.) there is about ten minutes walk to the towers and ticket office. Getting to Laolongtou (Old Dragon's Head): Although the Pass and the Old Dragon's Head were built and linked together (I believe it is still physically linked together through one continuous wall, but much of the walls are overgrown with vegetation and its passages are walled with bricks, so one cannot walk from the Pass to the Dragon's Head. If you are interested in finding out, like I did, you may walk to its open limit and will be stopped by a brick wall.) 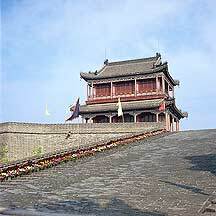 To get to 老龙头Laolongtou (Old Dragon Head): From the Shanhaiguan town take #25路lu (road) public bus (Y1), which will get there in 10-15 minutes. the entrance and the ticket office is in the back, close to the waters. But beware: the large area that you will enter once you are off the bus will have a few gimmick sites that shows nothing of historical value. They may pretend to be part of Laolongtou and lure people to its ticket office. There is only one ticket office for Old Dragon's Head. The officialness of the ticket office can usually be told by the numerous plaques on its walls, and the indifferences of the staffs. They won't come out to grap you in. 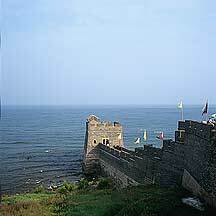 There are a lot of expensive hotels as well as cheap guesthouses outside the Walled town.